There are lots of experts around the world having master skill in Photoshop but i am going to share the some of Basic Photoshop tricks and tips for Amateur and beginners. You can do it with few seconds if you didn't even ever use Photoshop. No need to understand extra skills and techniques, you have to just follow the subject video and you will learn how easily it is, converting 3 images/photos/pictures into one. You can convert photos into any format using Photoshop, you can create picture and make editing with different images using this Application but today in this video I am sharing simple way of merging or you can say combining two images into one with Adobe Photoshop. I have previously shown the steps regarding merging 2 images into one in my past videos now this time i'm showing the procedure for converting 3 images into one by Photoshop simple and basic step. 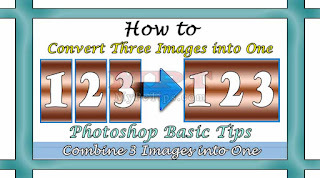 This tutorial will guide you how to convert 3 images into one Vertically and Horizontally, once if you know how to convert 3 images into one then your can merge as many images you want. Launch / Start "ADOBE PHOTOSHOP". Go to "FILE>>OPEN" or use "CTRL + O" to open your all three Images/Pictures. Now go to "IMAGE>>IMAGE SIZE" or use "ALT + CTRL + I" key to see the pixel of your current image. In 1st Image go to "IMAGE>>CANVAS IMAGE" or use "ALT + CTRL + C" and Select "PIXEL" from drop-down menu if it's in Percent or Inches by default. Now manually enter "WIDTH" such as 1536 Pixel. Now in "ANCHOR:" click on Left Arrow if you want current Picture to stick left side or click on Right Arrow to stick it to right side, leaving it will make stick in Center and then Click on "OK" button. Go to 2nd and 3rd Images use "CTRL + A" and "CTRL + C" to copy one-by-one. Back to 1st Image and press "CTRL + V" to paste both images one-by-one. Re-position Images using "CTRL + LEFT MOUSE KEY". Finally, go to "FILE>>SAVE AS" or use "SHIFT + CTRL + S" key to save image in any format. i.e jpg, png, psd, bmp etc. Now manually enter "HEIGHT" such as 1536 Pixel.